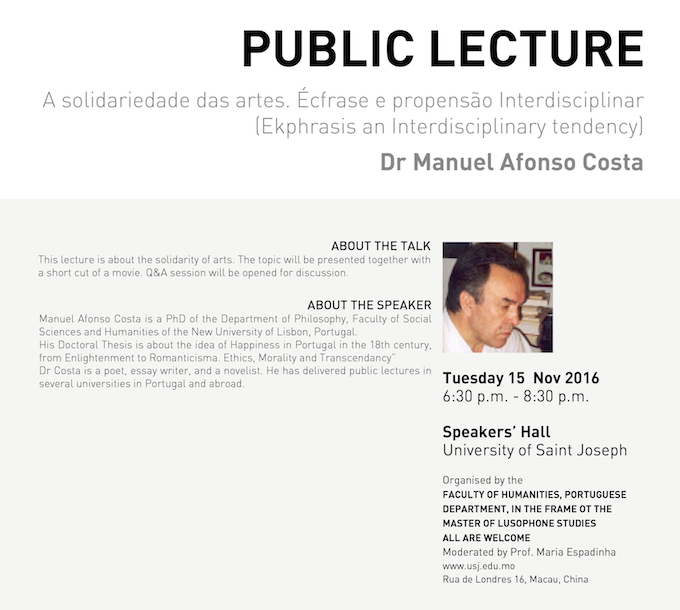 The University of Saint Joseph’s Department of Portuguese of the Faculty of Humanities is organizing a public lecture in Portuguese: “A Solidariedade das Artes: Écfrase e Propensão Interdisciplinar” on 15 November (Tuesday) at 18:30 at USJ’s Speaker’s Hall (16 Rua de Londres, NAPE). The Speaker, Dr. Manuel Afonso Costa, is going to talk about the solidarity of arts with the presentation of a short movie clip. After this public lecture, USJ’s Portuguese Department is launching a book with the proceedings of the international conference: Entre a desmistificação e a utopia: indagação sobre as Lusofonias. A free copy of the book will be offered to all guests. Refreshments will be served, and audience may interact with the speaker after the talk. Admission is free and no registration is needed. For enquiries, please contact USJ’s Public Relations Office at 8796 4433. Manuel Afonso Costa is a PhD of the Department of Philosophy, Faculty of Social Sciences and Humanities of the New University of Lisbon, Portugal. Dr Costa is a poet, essay writer, and a novelist. He has delivered public lectures in several universities in Portugal and abroad.